I am back in Lichfield for a very short visit that is many ways a pilgrimage or short retreat. Earlier yesterday [24 January 2018], I visited the Chapel of Saint John’s Hospital, which is usually my first place to visit as this chapel shaped my spirituality and my Anglicanism as a 19-year-old, and it remains a sort of spiritual home. In the evening, I attended Choral Evensong in Lichfield Cathedral to mark the beginning of the Feast of the Conversion of Saint Paul, and this morning I have a short meeting in the Cathedral Close. 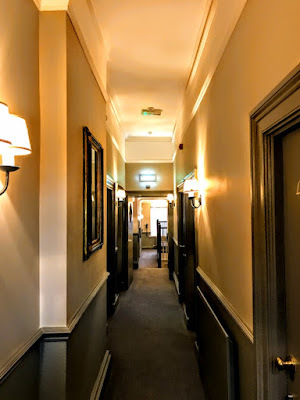 I have been staying overnight in the Hedgehog Vintage Inn on Stafford Road, which is a brief, brisk 20-minute walk from the cathedral along Beacon Street, and set on the edge of open Staffordshire countryside. The rooms here are named after different figures in Lichfield history, and I often stay in No 1, which is named after Saint Chad, the founding saint of the diocese and the cathedral city. Other rooms in the Hedgehog are named after great literary and cultural figures in Lichfield: Muzio Clementi (No 2), the composer who was a friend of Mozart and who once lived in this house; Erasmus Darwin (No 3), the grandfather of Charles Darwin and who also lived on Beacon Street in the 18th century; Anna Seward (No 4), the poet known as the ‘Swan of Lichfield’ who lived in the Cathedral Close; Lieutenant Colonel Swinfen-Broun (No 5), one of the generous benefactors of Lichfield; Harriet Lynch Thrale (No 7), the diarist and friend of Samuel Johnson; David Garrick (No 8), the actor who spent his childhood in Lichfield; and, of course, Samuel Johnson (No 9). 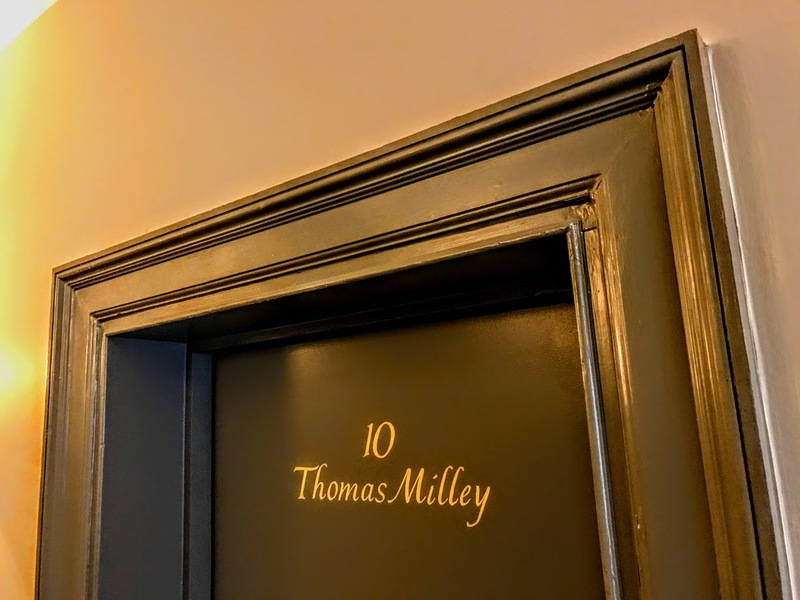 I am staying in the room named after Thomas Milley (No 10). In my walks between the cathedral and the Hedgehog along Beacon Street, I regularly walk past Dr Milley’s Hospital at No 7 Beacon Street, which I visited a few years ago [30 May 2015] as part of a small tour organised by Kate Gomez and the local history group, Lichfield Discovered. This hospital for fifteen women was founded by Thomas Milley, DD, Canon Residentiary of the Cathedral Church of Lichfield AD 1504. Stepping down into the hospital from Beacon Street is like stepping down in a bygone age, and I mean stepping down, for the ground floor of Dr Milley’s Hospital is now well below the street level on Beacon Street, due both to its original location in the town ditch, and to raising the street levels over the years, catering for the heavy traffic along the A51 which was once the main road from Chester to London, running through the heart of Lichfield. The front range, facing onto Beacon Street, contains a central stone porch giving access to a wide entrance hall flanked by rooms for the matron and almswomen. It is possible the large beam in the entrance hall below the chapel dates back to the building of 1504, and it is advisable to stoop your head several times to avoid a nasty bump. It is generally believed in Lichfield that parts of Dr Milley’s Hospital date back to the 16th century and that the building survived the English Civil War in the mid-17th century. Some of the glass in windows in the upper storey survive from the late 17th and early 18th century. The rear wing has a corridor on each floor, and these corridors originally gave access to residents’ rooms on the south side of the building. On the north side of the corridors is the staircase and also a two-storey addition, probably dating from the late 18th century, containing two rooms. At the bottom of the staircase, we were pointed to the covering over a well that provided fresh, clean water in the hospital until the first half of the 20th century. The building was designated a Grade II* Listed building in 1952. The hospital was extensively refurbished in 1985-1987, new kitchens were provided in 2013, the communal lounge and heating were renovated in 2014, and more recently the bathrooms in the apartments have been upgraded. I have only the happiest memories of early Eucharist in the Chapel of Chad's Head.